Jörgen Persson the many times World Champion has thoroughly tested the prototypes. After the series production has started he has immediately taken the blade SENSO to play with it. We quote Jörgen Persson: "I always feel the ball - no matter if I hit it slowly or fast. SENSO gives you the absolute feeling. It is always difficult to place controlled balls when using a fast blade like the POWERPLAY. The SENSO technology makes things much easier, since you get a prompt feedback from the ball. "Fast 7-ply offensive blade made in Sweden that can be controlled even with normal training thanks to a special thin layer of foil. Available in the two SENSO versions: V1= optimum speed V2= optimum control. 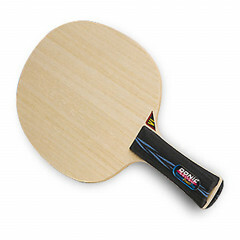 Donic Blade Persson Powerplay Senso V2 is beeing added to cart.